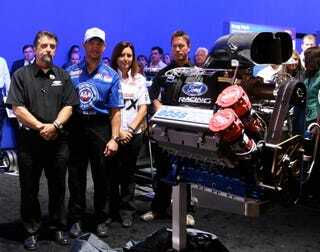 Ford and Force Racing unveiled the first new entry into the nitro burning hemi engine field in modern times. The crew developed the engine using space age analytical tools, beefing up the main bearing journals and surrounding webbing to help keep the crank and pistons from windowing the blue anodized block. Force Mustang Funny Car driver Mike Neff will be the first to huff the good stuff through the blower, with Robert Hight and Ashley Force phasing in the mill in their own Mustangs after nitro scientists John Medlin and Austin Coil fine tune the 8000 horsepower nitro burner.